Bristows is delighted to be offering an exclusive opportunity to members of Aspiring Solicitors. They will be hosting a presentation and lawyers networking lunch at their London office on Monday 30th October. Bristows is a medium-sized full service law firm well known for the strength of its intellectual property practice. This event will provide you with the chance to find out about their top tier work with clients in the most innovative industries, including those in the Life Sciences and TMT sectors, as well as learn about the opportunities available to you at the firm. 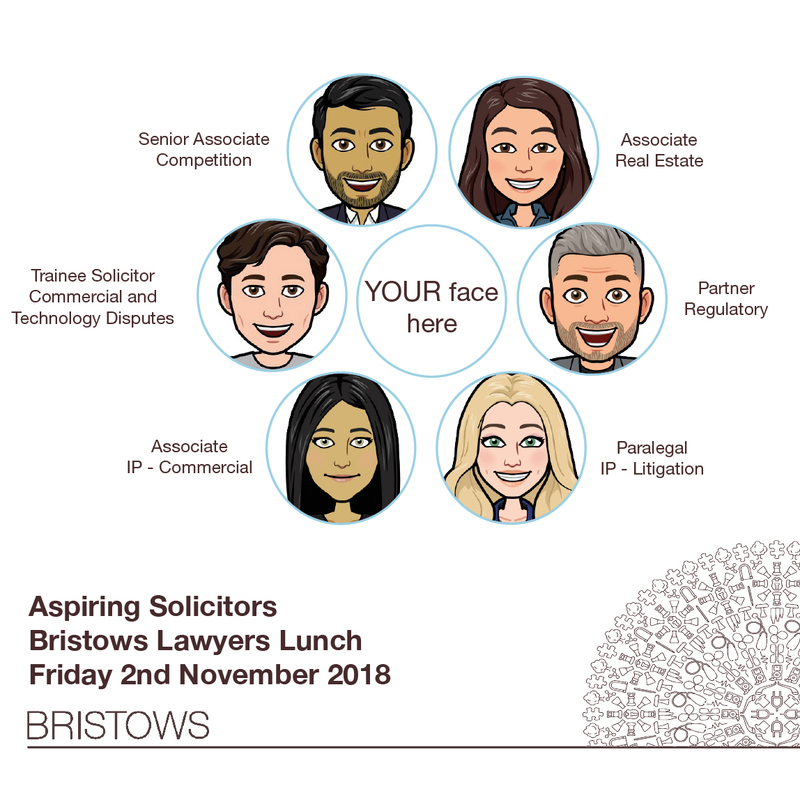 This event will enable you to network with lawyers from across the firm at lunch and experience the friendly and supportive culture at Bristows first hand. Be eligible to apply for a vacation scheme at the firm (penultimate and final year Law, final year non-Law students, all graduates (whether in post graduate education or working and career changers). All those who applied will be notified of the outcome of their application within three weeks of the deadline. We need to collect your personal details so that we can consider your application for our events. Please don't use an .ac.uk address as this domain tends to block our emails! Please ensure you check your junk folders as we will notify you via email of all stages. Please put a tick next to each of the events (listed below) that you would like to attend. Please only select the firms in which you have a genuine interest. Please note that we will only accept the last form you submit, so please do consider your choices carefully. Shepherd + Wedderburn, 27 November, Edinburgh. Please note this event is for those who wish to qualify as a Scottish lawyer only. Please state below any relevant significant mitigating circumstances you would like us to consider. If you have none, please state "NA" below. Aspiring Solicitors is a platform dedicated to increasing diversity in the legal profession. To be eligible to utilise our services, opportunities/events: - You must be from at least one of the following underrepresented groups (I) Black Asian or minority ethnic (II) Socially mobile (i.e. be from at least two of the following: a primary carer; from a low income family, attended an underperforming secondary school in the UK, state school educated (whether in the UK or overseas), first generation to attend university) be a refugee or have been in local authority care; and/or (III) have a disability or long term health condition or (IV) be LGBT+. You must not have accepted a training contract with any law firm or legal team; You must have an interest in pursuing a commercial legal career; and You must not have been rejected from any of the firm events you've checked below. Please confirm you have read and understood the eligibility criteria above for the Aspiring Solicitors events 2018/19. Please upload an up-to-date copy of your CV via the link below. Your CV MUST contain your A Levels (or equivalent), a full breakdown of your undergraduate degree (even if you have graduated) and any post graduate qualification such as a Masters, GDL or LPC. Please ensure that your CV contains your marks for the academic year 2017/2018. If your CV does not contain a full breakdown of your marks, your application will be automatically rejected. Please note we will only accept the first document you upload, so please do not send in a transcript, additional documents or multiple CVs. Please upload your latest CV following the guidelines set out in this form.